Variations in the intensity of the sun’s magnetic field with cycles including the Schwabe (eleven year), Hale (22 years) and Gleissberg (70-90 years). Effect of the sun’s plasma and electromagnetic fields on rates of the earth’s rotation, and hence the length of the day. Effect of the sun’s gravitational field through the 18.6 year Lunar Nodal Cycle, causing variation in atmospheric pressure, temperature, rainfall, sea-level and ocean temperatures, especially at high latitudes. Known links between solar activity and monsoonal activity, or the phases of climate oscillations such as the Atlantic Multidimensional Oscillation, a 60-year long cycle during which sea surface temperatures vary about 0.2°C above and below the long-term average, with effects on northern hemisphere air temperature, rainfall and drought. 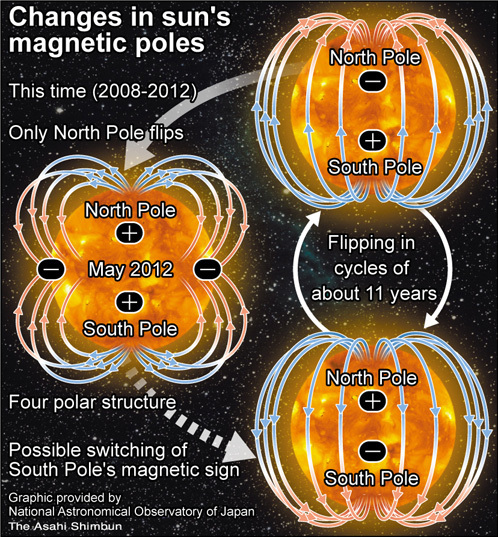 Magnetic fields associated with solar flares, which modulate galactic cosmic ray input into the Earth’s atmosphere. This in turn may cause variations in the formation of low-level clouds. This causes cooling: a one per cent variation in low cloud cover producing a similar change in forcing to the estimated increase caused by human green-house gases. As Robert Carter (2010) has stated: “That many of the mechanisms and possible mechanisms by which the sun influences Earth’s climate are poorly understood is no justification for ignoring them.” Of immediate relevance is the fact that solar cycles longer than the eleven year average are followed by later cycles of lesser intensity, and with it a cooler climate. According to Archibald (2010, Solar cycle 24 update. Available at http://wattsupwiththat.com/2010/02/02/solar cycle 24 Update. ), Cycle 24 may produce cooling of up to 2.2°C for the mid-latitude grain-growing areas of the northern hemisphere. This may have already started. The winter of 2010-2011 in Europe began with an unusually cold November caused by a cold weather cycle that started in southern Scandinavia and subsequently moved south and west over both Belgium and the Netherlands on 25 November and into the west of Scotland and North East England on 26 November. This was due to a low pressure zone in the Baltics, with a high pressure over Greenland on 24 November. From 22 November 2010, cold conditions arrived in the United Kingdom, as a cold northerly wind developed and snow began to fall in northern and eastern parts, causing disruption. The winter arrived particularly early for the European climate, with temperatures dropping significantly lower than previous lows for the month of November. On 28 November, Wales recorded their lowest-ever November temperature of −17.3 C (1 F) in Llysdinam, and Northern Ireland recorded their lowest ever November temperature of −9.5 C (15 F) in Lough Fea. The UK Met Office issued severe-weather warnings for heavy snow for eastern Scotland and the north-east of England. In that era, known as the Maunder Minimum, temperatures are estimated to have been about 2.5 degrees lower than in the second half of the 20th century. The Japanese study found that the trend of current sunspot activity is similar to records from that period. 1.The sun is the major factor in climate change.